As the weather is getting warmer, it’s time for outdoor fun with the kids! On the really hot days, one of the best places to be is in a sprinkler park or in one of the city pools. 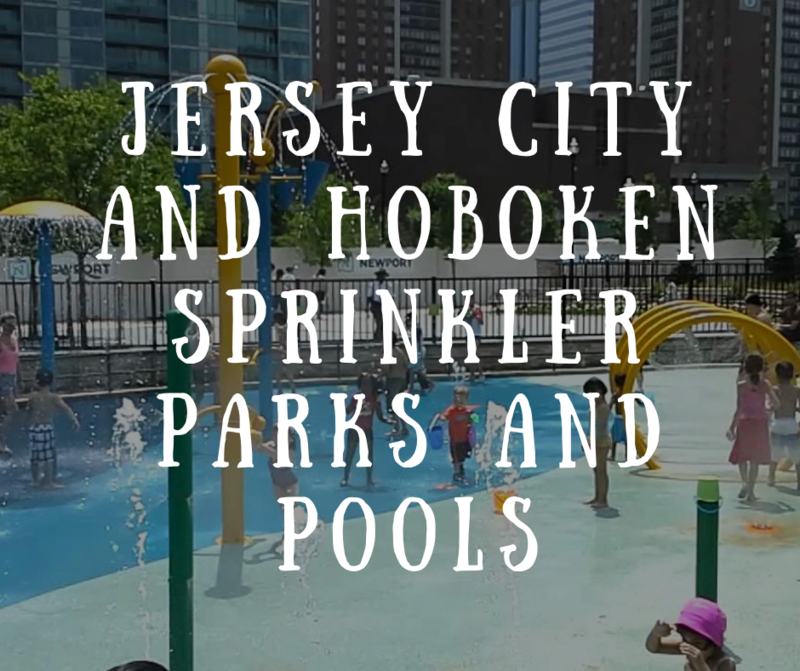 We have gathered a list on the Sprinkler Parks and Pools in Jersey City. A few of them are in Hoboken as well. Time to enjoy the season changing by keeping your kids active outdoors! Pavonia Pool is located in the West Side neighborhood of Jersey City. The pool is open Monday, Wednesday and Friday from 8am – 7pm (8am-9am for adult swim), Tuesday and Thursday from 8 am to 5:30 pm (8am-9am for adult swim, 9am – 10am for free swimming lessons for children) and weekends from 10am – 6pm. Lafayette Pool’s location is very convenient to downtown Jersey City and Liberty State Park. The pool offers a kiddie pool with water features and a slide, a larger pool and a snack stand. The center is open until September 9th, Monday – Friday from 7am – 7pm. (7am -9 am for adult/lap swim only, 9am – 10 am for free swim lessons for kids and 10am – 7pm for everyone). Weekend hours are 10am – 6pm. Pershing Field Pool is an indoor pool that is open all year round. Parking is available on the street or in the lot. Parking lot and street parking available. Families can visit for open swim during the hours of 7am and 8pm on weekdays. Saturday, Sunday and holidays open swim is available between 12pm and 6pm. There is also a children’s playground with water sprinkler on-site. If you’re not up for bringing your kids to a pool, they can still have fun with the water splash pads that are offered at several public parks in Jersey City! All sprinklers are open daily from 11am to 7 pm. This water playground is on the smaller side but your little will definitely have a blast! The splash pad is fenced in and features in-ground sprinklers and buckets of water dropped from overhead. Hamilton Park is nestled in the heart of downtown Jersey City and offers a large playground, tennis courts, dog runs, a basketball court, and lots of grass on which to play. Bonus: the Hamilton Park area of Jersey City has tons of great food options! Newport Green is a unique little park! Not only does it offer a fun sprinkler area, it also has a large and modern playground — complete with something for kids of all ages. This park also boasts a small carousel that’s a huge hit with the younger kids. A small sandy beach with umbrellas completes this downtown oasis. Parking can be an issue, so make sure to follow the rules posted on signs along the streets. Also, remember pets are not allowed at Newport Green. Pets are allowed at several other parks, though. Check our list here! This small park has a cute sprinkler area in the playground. A whale, dolphin and seal squirt water and kids have an area to run around and play while cooling off. The playground is right there, so kids can run from one to the other, plus the entire area is gated. A small, pretty community garden project is in the corner of the area. The park also offers a skate park, for those who love to ride their scooters on ramps! You can walk around the entire park and it’s usually a nice quiet walk. Feel free to bring dogs! This park is within walking distance of the bigger Hamilton Park, so if you feel like hitting two in one day, it can easily be done. Stop by a local (kid-friendly) eatery like Carmine’s on Brunswick and 7th for a sandwich or sit at an outdoor table at the White Star for a burger and fries. This newly-renovated park includes a sprinkler area, brand-new playground equipment, swings and even an area dedicated to toddlers. There is also a dog run, so feel free to bring the dogs. Hoboken Public Library is right across the street, so you can pop in for story time if you are feeling too hot. Don’t forget to stop by Sweet for what some consider the best cupcakes in the area! This park is tucked away in a quiet area of Hoboken. After you wear yourselves out, walk down to the original Hoboken location of the famous Grimaldi’s on Clinton and 2nd Streets and grab a slice of what is hailed, by some, as the best pizza ever. This park is currently under renovation. Hudson County awarded the City of Hoboken a $500,000 grant for improvements to the Madison Street Park Playground through the Hudson County Open Space Trust Fund. The project began with the public process in January, following by a concept design approved by the City Council in February, and Construction Contract awarded in October. Madison Street Park will reopen on or around April 15, 2019. Close to the waterfront, this location allows you many options to walk around with your little ones. Take a walk to Shipyard Park or Castle Point Skate Park. For dog lovers, there is also an amazing a dog run! There are countless cafes and pizzerias in this area, so take your pick and enjoy! For more information on Hoboken parks and splash pads call 201-420-2012. Both in Jersey City there are several options for families to enjoy the nice weather outside. Whether you’re in the mood for a nice walk in the park or if you’re prepared to get soaked in the pool or sprinkler, there’s options for all families! After staying active, make sure you grab a bite to eat, there are tons of options when it comes to food as well, both indoor and outdoors. Previous Previous post: Visit a Garden this Summer!